The Glass balustrade models by Balcony Systems are very easy to select and price out. We offer a variety of services from supply-only to a full supply and installation package on larger projects. Use our easy and dynamic online pricing to get a real-time price on your balcony sizes, models and available options. Also feel free to call one of our friendly experts if you have any questions. Choose a glass balustrades model and get price online. Choose below from the different systems, each system gives its own advantages and options, ranging from the classic Balcony System through to the fully frameless. Available in 4 standard colour finishes: White powder coating, Silver Anodised, Bronze Anodised and Balcony Systems' Proprietary Royal Chrome Anodised finish. All finishes come with Balcony Systems' 10 year Guarantee. All standard size glass balustrades come with 10mm clear toughened glass. Custom balustrading can be supplied with a choice of different tints: clear, green, grey, bronze and blue. All glass types can be supplied with the unique double sided self-cleaning glass coating. There is no doubt that a glass balustrade adds elegance to any home or commercial property. A glass banister, glass balustrading or a glass balcony, are stylish features that work handsomely in almost any decorative or architectural context. They combine their own beauty with less obstructed views and the practicalities of wind-breaking, durability and easy cleaning and maintenance. But technology has moved forward in the direction of better glass balustrade design and greater flexibility of choice. By making technical improvements in the design of the glass balustrade structure we have been able to integrate the strength of precision-engineered handrail profiles, lighter glass and strong supporting base. The result is light, strong state-of-the-art glass balustrading that requires very few, and in some cases no, vertical supports. These improvements mean we can offer you a more versatile range of glass balustrade design options. The “wow” factor of glass balustrades, the sense of uncluttered spaciousness and clean lines of a glass banister or glass balcony and a wealth of stylish options are now yours, even on a limited budget. Combining our technical advances with traditional concepts, we can offer four basic glass balustrade designs. They range from the all-glass system through less expensive alternatives. Yet we retain the desirable visual appeal of all-glass balustrading and provide a wider range of aesthetic and financial opportunities for you to achieve the effect you want to create. Included in that choice is one of its most appealing features: beautiful curved glass balustrading. Please see our picture gallery of glass balustrade designs we have installed across the UK. Our balustrades are straightforward to install and fit but you can choose whether to go for supply-only and install the balustrade yourself or, depending on where your project is, we may be able to recommend a Registered Partner who can install for you. Our glass balustrading is tough, resilient and virtually maintenance-free. Even keeping it clean is easy, particularly if you choose the option of our self-cleaning coatings. The secret of how we have combined lightness and strength in our innovative glass balustrading lies in large measure in the design of the aluminium handrail. Yet the strength incorporated in the handrail has not impaired the creation of beautifully shaped rails with a choice of attractive and hard-wearing finishes that have better resistance to staining, weathering and tarnishing than stainless steel. The glass for our balustrades has a choice of four different tints. It can also be supplied with a unique double-sided, self-cleaning coating. 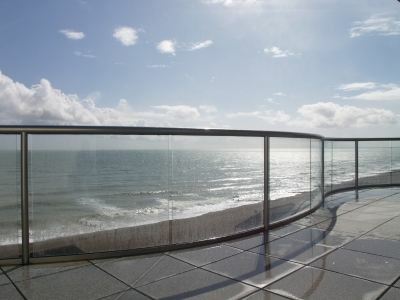 Our glass balustrade systems can be used on balconies, banisters and decking. They provide strong, beautiful and cost-effective alternatives to traditional railings or other glass balustrading systems with considerable practical and financial advantages. We are always pleased to provide assistance and technical support and to answer your questions promptly. To find out more about our glass balustrade systems, please contact us. The Balcony System Glass Balustrade is a unique glass balustrade system, mainly relying on the strength of the handrail and thus allowing wider spans of glass than any other balustrade system. The Balcony 1 System Balustrade has a 70mm diameter handrail and with the new 72X72mm square Newel post can be used on stairs. Royal Chrome anodizing is the process we at Balcony Systems use to create a special anodized finish that has all the traits of anodized aluminium yet has the finish which looks like polished stainless steel. When a railing profile is used in the manufacture process of balustrades and handrails it requires to be notched, cut, tapped and drilled. These processes will of course penetrate the protective anodised layer. The beauty of using aluminium profiles for railings lies in the natural traits of the material. When glass of a balustrade is not just used as an infill panel but is also used as the actual structure of the balustrade it is often referred to as a structural glass balustrade. It also sometimes referred to as a frameless glass balustrade or a cantilevered glass balustrade. Balcony Systems balustrade is a type of a hybrid system meaning it's combining two types in one. Our balustrade combines the strength of the handrail, glass and when needed posts, it is unique in nature and no other system on the market works in this fashion, and as such it allows different options than the other systems. There are a number of principles that the Balcony Systems Balustrade is built upon, the main ones are listed here below, these are sometimes used in combination withone another.